Rotator cuff syndrome is a common shoulder injury, but not a lot of people could tell you what it is if they haven’t experienced it for themselves. If you said, “shoulder injury,” you’d have a lot more people nodding in understanding. But not as many people understand what the rotator cuff is or where it is in the body. The rotator cuff is a grouping of four muscles that control your shoulder joint, which is a simple ball and socket connecting two bones. The four muscles are the subcapularis, infraspinatus, supraspinatus, and teres minor. These muscles encase the scapula and also connect to the humerus and clavicle. Numerous tendons, ligaments, and other elements help the rotator cuff to operate smoothly. For example, a lubricating sack lies between the tendons and the bone to protect the tendons from rubbing directly on the bone and becoming inflamed or injured. Rotator cuff injuries occur when any of these elements are strained, torn, or otherwise damaged. Rotator cuff syndrome can refer to any number of injuries, such as muscle tears, inflammation that causes intense pain, or tendon strains that limit mobility. Rotator cuff syndrome can be caused by acute injury, or it can be a recurring problem caused by repetitive stress injury. You may have pain for even simple tasks, like reaching for your seatbelt, putting your hands behind your head, or when raising your hand. If you have pain when you are at rest, you likely have a serious injury that will require more extensive treatment or even surgery. If you experience any of these symptoms, you should see a rotator cuff chiropractor in Mesa to get to the bottom of the problem and discuss treatment options. A rotator cuff chiropractor in Mesa can perform a series of tests in the office to determine if you have a rotator cuff injury and where it is. Your chiropractor will also take a full healthy history and talk with you about your symptoms. The more information you can provide, the better your chiropractor will be able to pinpoint the injury. An ultrasound may also be performed to provide more exact information about the injury. An ultrasound can detect a tear and similar injuries, and it can show exactly which muscle, ligament, or tendon is involved. It can also identify contributing factors, such as a reduction in lubricating fluid. Rotator cuff treatment depends entirely on how you have been injured and how severe the injury is. If the injury is relatively minor, you may be able to let it heal on its own while you take steps to protect the area and prevent further strain to it. You can also use anti-inflammatory medication or creams to reduce pain and further irritation to the area. More serious injuries may require ongoing physical therapy or even surgery. In many cases, chiropractic care in Mesa is an excellent form of rotator cuff treatment. Chiropractic care aligns the bones in the spine and in the joint, ensuring that an imbalance is not pulling the muscles in unnatural positions so that they are easily strained or torn. A rotator cuff chiropractor can also relieve subluxations so that pressure does not contribute to muscle strain or pain. You do not have to bear the pain of a shoulder injury. Getting treatment can help you regain the full range of motion faster and can help you be free of the pain. See a chiropractor or physical therapist as soon as possible to get the relief you need. Body Workz in Mesa offers rotator cuff treatment from our chiropractic team. A rotator cuff chiropractor from Body Workz will get to the bottom of your shoulder injury and will come up with a treatment plan to provide full healing. The goal will be to bring your body into alignment to treat the current injury, as well as to prevent future injuries from occurring. 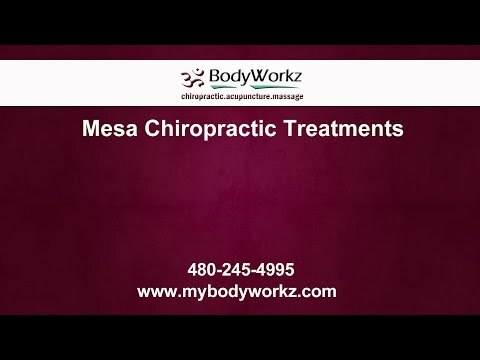 Call us in Mesa today to learn more about our body services or to schedule an appointment with a rotator cuff chiropractor.